Davie, also known as ‘DJ’ on the Clan Forum, hails from Campbeltown. After a break of 10 plus years from Minis, I bought this one, an ‘83 Mayfair from eBay. As it was in Telford, I bought it without viewing, knew all the pitfalls so asked plenty questions (just my luck I got a lying prat ) and took a gamble and won it! My friend Gerry and I left here at 4am in his motor, drove to Glasgow then got a train to Telford. Picked the Mini up in heavy rain, so I wasn’t surprised it was misfiring a bit. Once home the misfire was traced to a blown head gasket between 2 and 3 cylinders and the so-called new rear subby was rotten, along with most of the rear seat, boot and heel board. So less than a month after getting it, it was off the road for about 18 months while it was welded and the engine changed a bit. 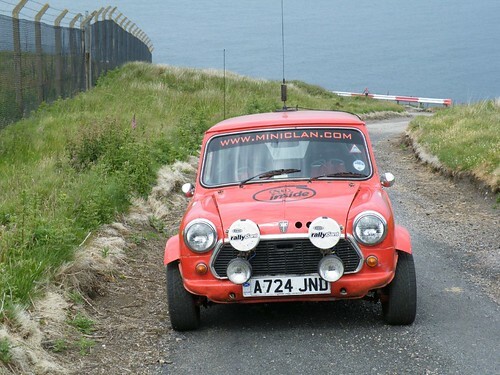 Rolled out of the shed and was MOT'd the day before TR 07 where we gatecrashed it in Oban. It was then back in the shed for a respray in time for my first Clan run, Selkirk 07. Not much has changed since apart from a few scars and a gearbox change. Engine is a 1275, modified head with MG Metro valves and double valve springs, 544 cam and twin HS4 SU's. 12" wheels, I would rather have it on 10’s and the wheels tucked in a bit. Got to be the induction noise from the carbs with the 3" ram pipes! And just the fact it keeps going after all the abuse! Not much planned for it. It was built to be messed about in, so just keep it going and concentrate on sometime getting the van started again! A MK3 S, looking as standard inside and out as when it was built but with a few engine mods.